We sadly must report the passing of Mr. Shelby over the rainbow bridge. He was a wonderful little dog and is greatly missed. 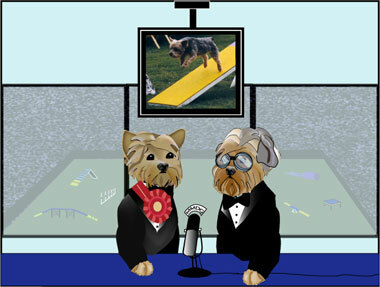 Live from the AKC National Agility Championships . . .
Hello there, this is ace reporter Mr. C.T. Bun reporting from Florida. With me, here, is Desmond Aloysius Shelby. Mr. Shelby is the number one Yorkie in AKC stats for 2004, number 7 top overall dog, came in second at the AKC Agility Nationals and has multiple agility championships (known as "Master Agility Championships" or "MACH"'s) under his belt. He has kindly agreed to answer a few questions. B. Mr Shelby, how did you first hear about agility? What made you decide to get started? S. A friend of my mom's was starting to do agility in 1998. We went out to watch and decided it looked like fun. B. Did your mom have any special training before she started training you? S. My mom and I started agility at the same time. She had never had any training so we learned together. We used to go to a guy's house who had the agility equipment set up in a horse ring. My mom would put $5 in a coffee can and we could use the equipment. If you were new, the guy would show you how to do the obstacles like the teeter and weave poles. We did the weave poles on leash with my mom on the right side. I still do on side weaves because I can't do them off side without losing my place and pulling out. B. Where do you practice? S. We now take a class from Anne Platt up in Escondido every Tues. morning. We usually go to a trial most weekends so the only time I practice is in class on Tues. Lately we have been rained out of a lot of classes. My mom does belong to an agility club and there is a place that we can go practice but with class on Tues. and trials on the weekends we don't go out there much. B. How many times a week do you practice? S. Like I said, I just practice on Tues. morning if it's not raining. B. How long did you do agility before your first competition? Can you tell us a bit about it? How did it go? S. We started going to the guy's horse ring with the agility equipment in it at the beginning of Aug. 1998. We went once a week and mom entered me in my first trial on Oct. 31, 1998. That was only three months since I first got on agility equipment. I guess I was a natural. HA! Our friend told us that I had to jump in the 12 inch class so I did that at my first two trials. I got a Q in the very first Novice Std. course that I ran. That was pretty exciting My mom walked me around a lot before our Jumpers run that first day so I was pretty tired. I didn't Q in my first Jumpers run but I think I got a Q in Jumpers the next day. B. What challenges did you face along the way? Have you ever considered giving up? S. The biggest challenge that I have faced was when I tore the lateral collateral ligament in my hind left leg. I had already had the luxating patella surgery on that leg when I was just a year old. The vets put a wire around the ligament to help it heal and two months later when I was still limping the vet X- Rayed my leg and the wire was broken inside. They had to do another surgery to take the wire out. I was out of agility for about eight months, from Jan. 1999 to Aug. 1999. Here I had just started in agility and I had gone to two trials and I had to sit out for eight months!! The only good thing that came out of this whole thing was my mom had me measured at one of the trials we went to to watch while I was getting better and they said I could jump in the eight inch class. That was a relief. In Aug. of 1999, the vet said that I could do agility again but only the Jumpers class. He didn't want me climbing the A Frame. So I went on to get my OAJ before I had even completed my NA. I did get my NA in May of 2000 when I could enter the Standard class again. I have never considered giving up agility but I know my mom has. She got pretty frustrated with me when I would take off- course obstacles and mess up in my runs. I have seen her cry when she came off a course because I flew off the teeter or missed my weave poles. But she knew that I really loved agility so she stuck with me. I'm glad she did because I got better with practice and experience. B. Can you tell us a bit about your experience at the AKC Nationals? - What do you need to do to make the finals and when did you know you had made the finals? - What happened before you did your final run? Why didn't you loose your "cool"? S. The AKC Nationals were a lot more fun for me than they were for my mom. I saw her taking a lot of Imodium and Pepcid AC while we were there. I didn't need to take anything. It was so exciting just to be there. We went to the Nationals last year in Long Beach but I had a hard time running on the Max Trax. I slipped out of the weave poles in every run. There were only 29 eight in dogs in Long Beach but there were 60 in Tampa. That made for a lot more competition! I ran on rubber matting this year and I never slipped in the weave poles once. To make the Finals, I had to have three clean runs. In each of those three runs I almost went off-course but my om called me back in time to save the run. We wasted time but we were clean. I even tried to go off-course in the Finals but my mom called me off in time again. They were letting the top 5 eight inch dogs into the Finals. They took the accumulative scores from our three runs and the top 5 got to the Finals. I just made it by the skin of my teeth as we were number 5. If I had made one mistake in any of my three runs we wouldn't have gotten to the Finals. That was pretty scary to think about. Since my mom and I were the last dog on the list to make the Finals, they made us run first. They didn't show it like that on Animal Planet. They made it look like I was the 4th dog to run. Nope.....I was the first one to run. My mom and I stood at the start line for what is seemed like forever. The people from Animal Planet were trying to get their lighting right. The people sitting in the stands had been waiting for two hours and they were anxious for things to get started. The judge told my mom that we could start so she put me down on the line. Right then the Animal Planet people stopped us to do more lighting checks. This happened to us about three times. The people in the stands were booing now. Finally everything was ready and they let us run. When my mom put me down, the crowd went wild. It was like they were cheering for us but they were just happy that things were finally going to get started. The lady who trains us taped the whole thing. I had a clean run, almost going off-course once, and we came in 2nd place behind a Papillon from WA. We know Trigger and he is a fast little bugger. He is a lot lighter than I am. Mom had better cut back on my dinners. HA! I never lost my cool before I ran because I just love to do agility. I just figured we would get started sooner or later. B. What do you attribute your success to? S. I attribute my success to my mom's hanging in there with me. I was pretty funky for a long time. B. Do you think you possess "special skills" or "talents" for agility? S. I think I possess special skills for agility. I think I was born to run agility. I love getting on the equipment. I love everything about agility. I know I am a lot better than my little brother, Adam, because he took lessons for a year and a half before he ever ran in a trial. And he's still not that good. He idolizes me and maybe some day he will get better but I doubt it. I think some people or dogs are just born to do certain things. I was born to do agility like Shaq was born to play basketball. B. What advice could you give other toy dogs looking to get involved in agility? S. Other toy dogs who want to do agility should just hang in there and give it their best shot. You always get better with practice. There is always going to be a better, faster dog than you but as long as you are having fun, that's all that counts. I know when I come off a course now, I never know whether I got a Q or not because my mom always treats me the same. I always get praised and the most important thing....I always get my Great Bait. I love that Great Bait and the only time I get it is at agility trials. I have rambled on here for a long time now and my mom is telling me that she is going to take us all to the park. I love going to the park. I get to chase my toy and I get some treats too. So take care, Bun, and I will talk to you again soon.